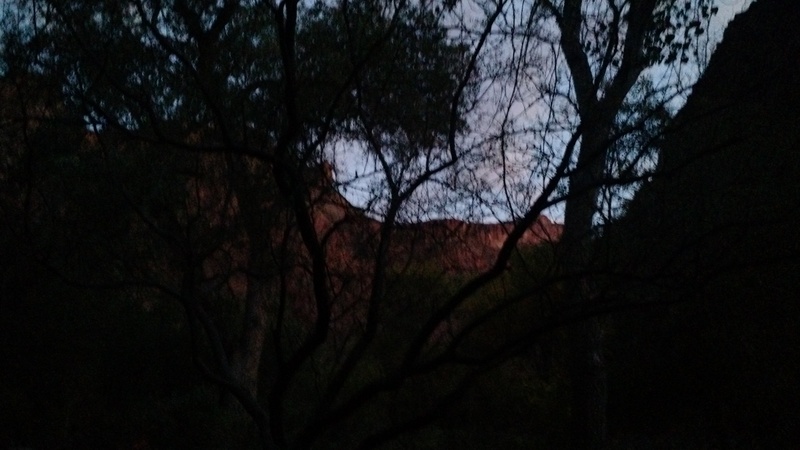 Our kind neighbors had vacated the group spot an hour before the sun fully rose and the light crept into the canyon. We could hear them banging food containers and giggling as they looked forward to their next adventure. We had met so many great people from all over the world. It was our turn this morning to go home. We were both eager and sad. This campground was our home for a couple of nights. The Bright Angel Creek was still muddy unlike the first day when we soaked our sore calves in the ice cold water when it was blue. 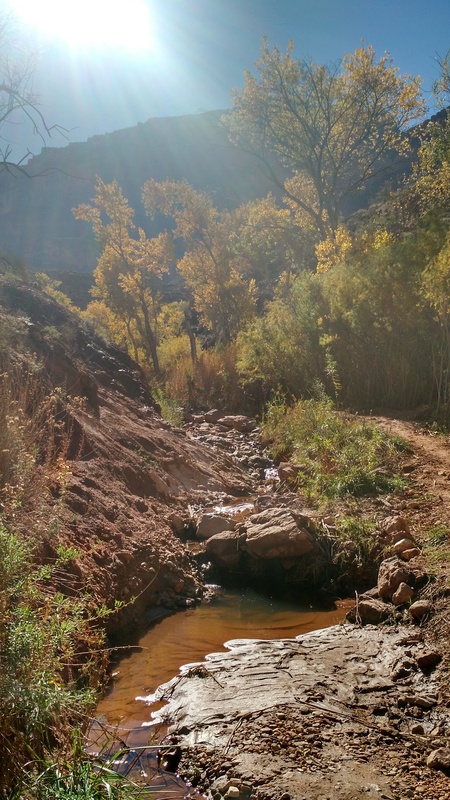 The creek still tore over rocks in furious temperament, pushing mud to the Colorado River after yesterday’s rain (and snow on the rims). It had risen higher than the first day we sat on its banks. 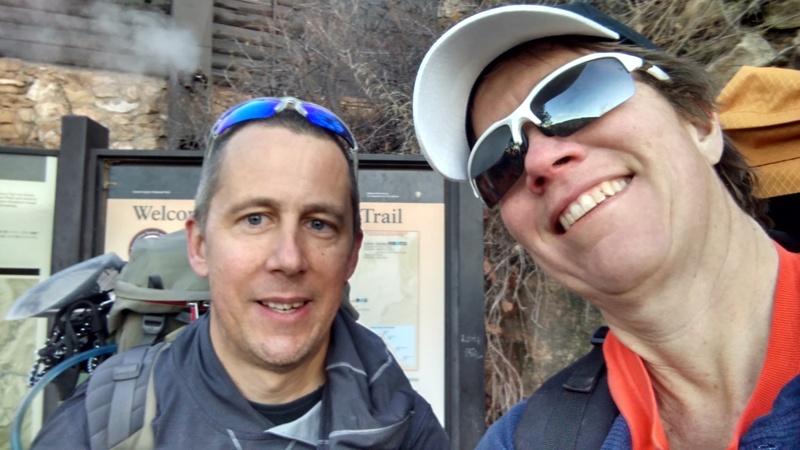 We started on our journey at 9:30 a.m. Our backs ached, protesting the 25 and 27 lbs we wore, and our legs strained, still feeling the stiffness and soreness of previously coming down the Kaibab Trail on Sunday afternoon. Climbing up would use different muscles. Our spirits soared as we looked forward to seeing what sights God would show us on our way to the South Rim via the Bright Angel Trail. Of course, we began our journey in prayer like on Sunday. 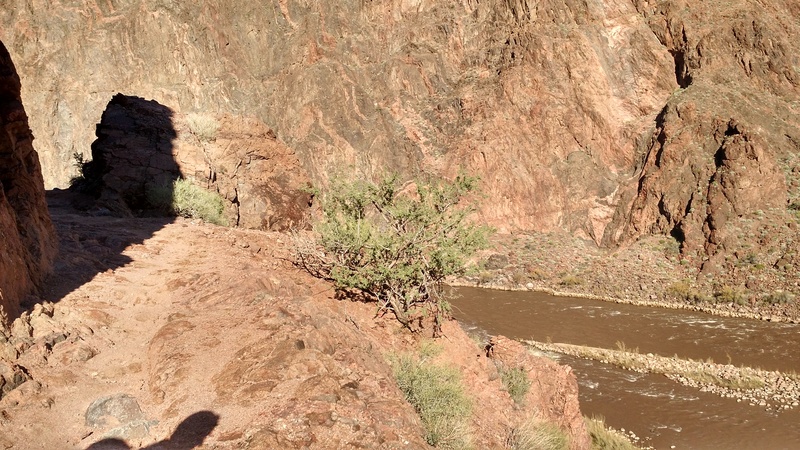 What we didn’t realize is how long the Bright Angel Trail was and what an ordeal awaited us. 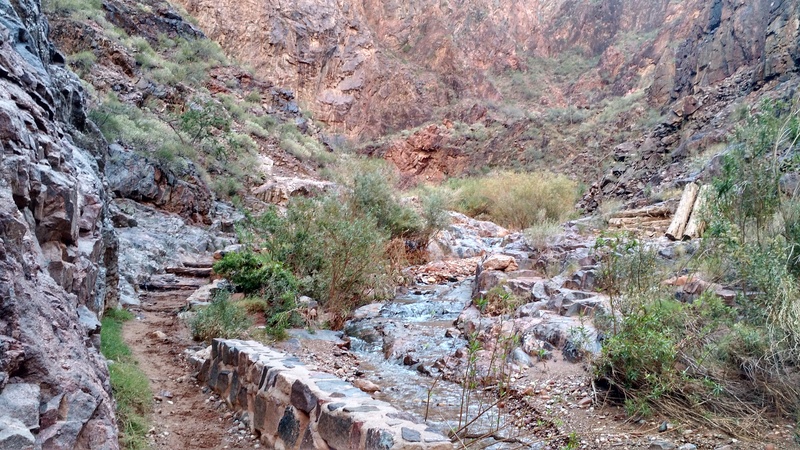 The Bright Angel Trail from Phantom Ranch is about 9 miles long. 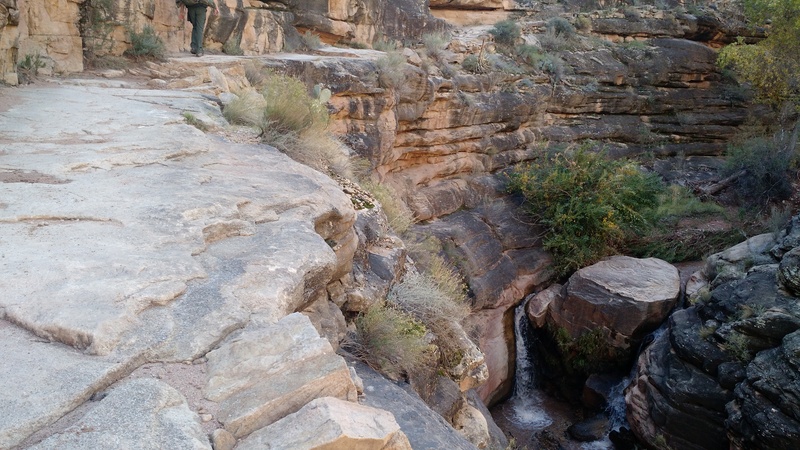 It’s easier than the Kaibab Trail (7 miles) because it’s not straight up. 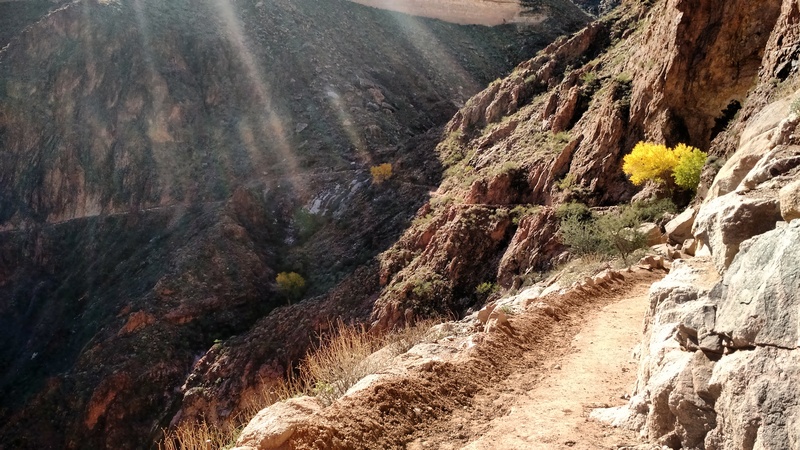 Some journeys are barren of joy, straight up grueling paths that cause us to wonder why we feel alone. Where is God in our struggles? 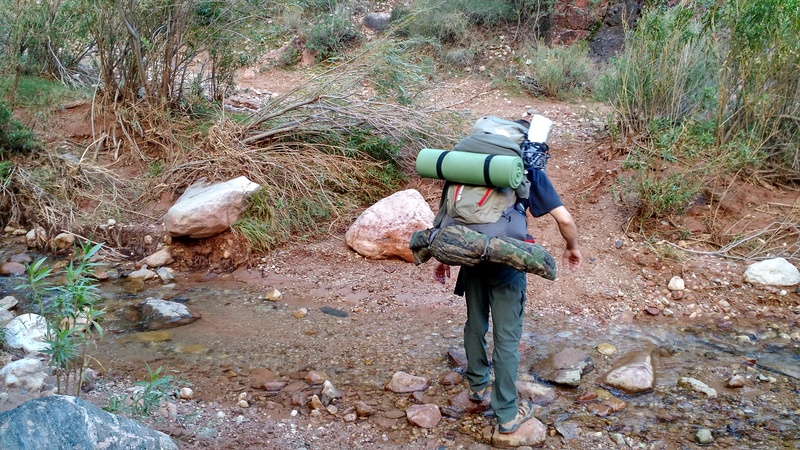 We think we are alone until we encounter people on the way as in the first day when we discovered a hiker in distress. A little aspirin goes a long way. Thinking back on your own past, can you recall those times of struggle and how you were never alone? We may not be rescued from the situation, but God gives us the tools, the friendships, and even a way out. How do we recognize these things? Words are easy to speak, but not so easy to live out. So many beautiful sights met our wondering eyes. The mantra kept running through my head, “One step at a time.” Coming home is usually about facing our demons one step at a time and letting Jesus change us from the inside out. Each step was harder to take. My shoulders ached. 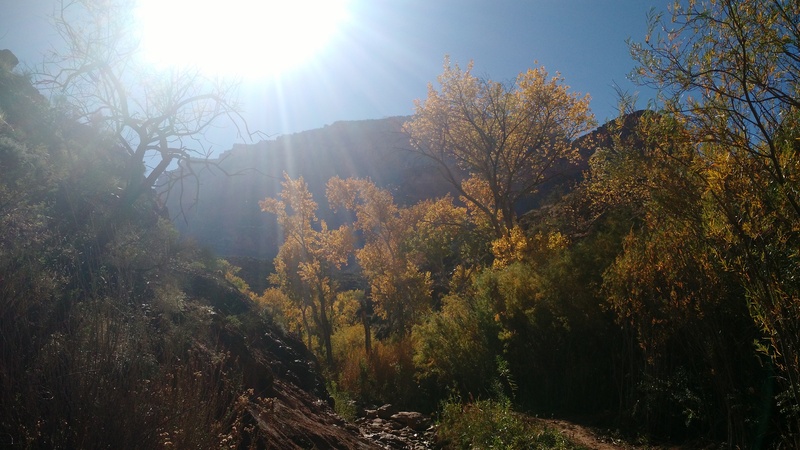 Hope grew as we climbed higher through the canyon towards the South Rim. Miniature waterfalls tumbled from gray rocks, framed by the golds and greens of Fall. I had to stop and take it in on occasion. My eyes were laser-focused on reaching the South Rim by dark. Moments like this make you feel impatient to reach the end. Too much focus on the end makes you miss what you can absorb from the journey. 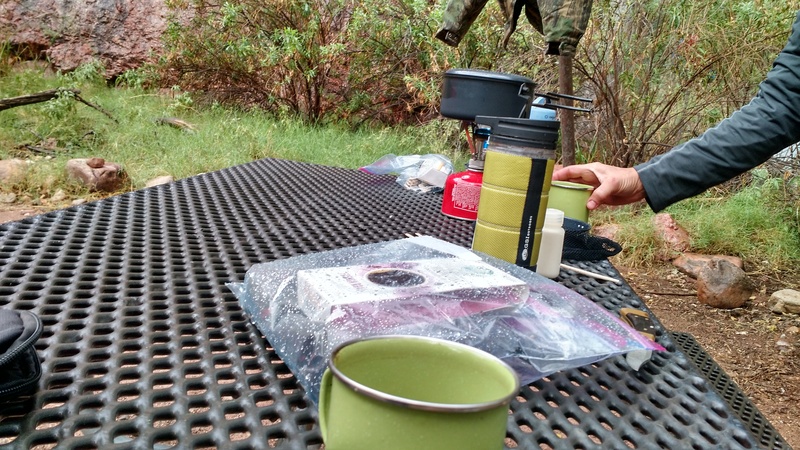 What I would have done differently is planned a third day of camping out, and camped out at Indian Gardens (5 mile mark) before tackling the beast up a canyon wall to the South Rim. 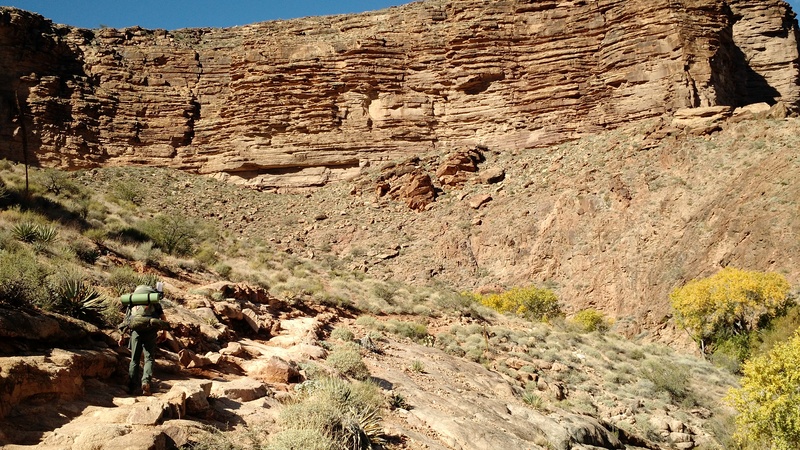 Most of the remaining four something miles was steep switchbacks in the shadows of the canyon walls. The temperatures began to drop, but it was subtle. Three miles from the South Rim, I pulled on a sweater. My fingers tingled. My back ached. Tony kept stopping every few yards as fatigue made every step painful and hard. I kept my eyes on the end. I made conversation with new friends. We shared the pain of our struggles up. Slowly and patiently, we passed the first arch. 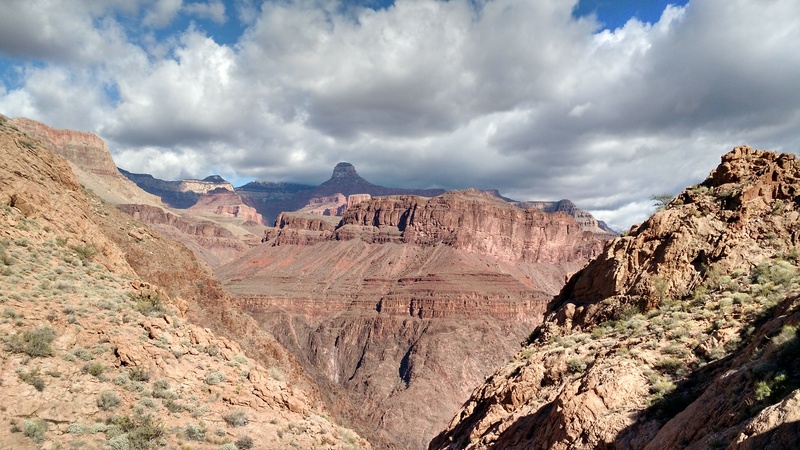 In the distance, the echo of the Grand Canyon Train gave us courage. It’s those little things–God moments–that give us the ability to finish the task we’re given. I pulled ahead to another curve in a switchback and saw the last tunnel and the brown siding of a South Rim building. Less than a half a mile and we were coming home! One of the things I did not do was to leave my partner behind. This was a first for us, and I wanted both of us to finish together as husband and wife. At the end, I cried. To me, this symbolized the whole journey of raising up financial partners–keeping my focus on the end and yet taking note of the sights and sounds along the way, leaning heavily on God to prepare the way. Click here on verses for suffering. Do you need prayer?